In my first post in this series, I talked about the “disenchantment” of the world through industrialization and the rise of a religious tradition that did not acknowledge the land as sacred. And truly, a disenchanted worldview–where only the physical matters, and where the physical landscape is viewed only as a resource from which to extract wealth–literally strips the sacredness from everything: very little is “sacred” in our current culture. In this culture, money, and the pursuit of it, is the most sacred thing. Some of our national landmarks are tourist attractions, and may hold sacredness for someone (like the Veterans memorial for someone who lost a solider at war) but even these spaces are fairly rare. Churches, mosques, synagogues and other such places may also hold some sacredness still, but even that seems fairly minimal. Most major natural wonders are now tourist attractions, and tourists are anything but respectful or reverent. Even sacred places around the world, like Stonehenge, are routinely desecrated through garbage, graffiti, and more. I think that what I’m describing is the reality of living in a disenchanted world, where nothing is truly sacred any longer. If we don’t know how to treat anything as sacred, how can we re-enchant our lands? In this post, I start to explore some of the building blocks and considerations for doing this. In order to create sacred spaces, we need to consider a number of different building blocks that help us pick up the pieces and begin again. Intentionality. The first building block of bringing the sacred into everyday life is about intentionality and acknowledgement. Sacredness happens in many cases because we choose to make it happen. We choose to offer an event, a place, an object, a mantra or prayer, or even a person some special meaning, some important significance, something that takes it from an everyday “mundane” thing and into something that has meaning beyond the every day. That that object , place, event, mantra, and so forth is something different, something out of the ordinary, something that requires reverence and special treatment in some way. Individuals can create the sacred, but so can groups, on a different level. For example, declaring intentions at the start of a ceremony where you are establishing sacred space and time (such as the OBOD opening) is a sacred act. Speaking the words is a powerful act that sets your intentions. When I was homesteading in Michigan on my land, I created a lot of signage that also set intentions. My garden had a sign that said “Cherish Earth” (which will go on my new garden this year). 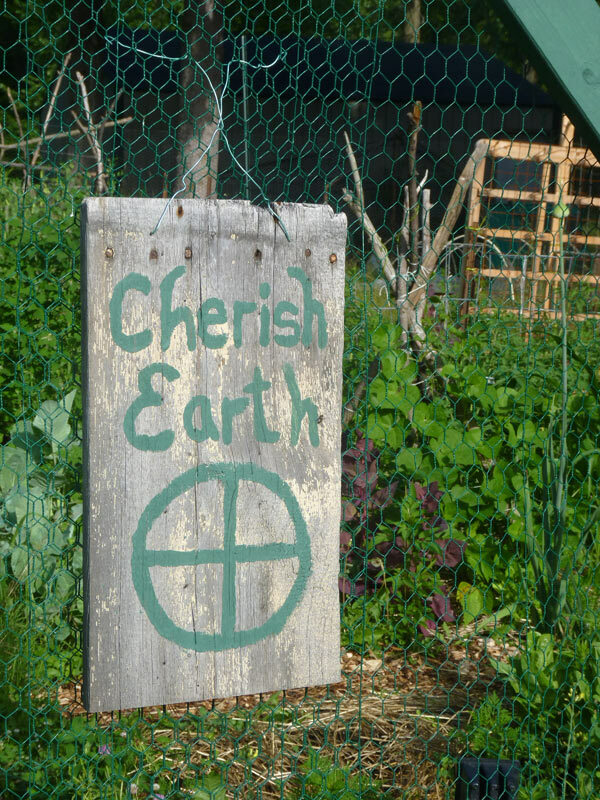 That sign set the intentions for me working in the garden each day–as a place of sacredness, as soil to cherish and nurture. Time. Time helps us build a relationship with space. The more that we acknowledge and engage with a sacred place, thing, object, prayer, and so on over a period of time, the more sacredness it begins to take on. This is both because of human psychology (repeated patterns become individual rituals) but also because of magical reality (the more energy you put into something, the stronger that thing becomes). A simple analogy here might help illustrate this point. Let’s say you start with an empty field, and each time you visit a sacred place, you bring a stone. After 10 visits, you have 10 stones, and have built a stone cairn. After 100 visits, you have four stone cairns at each of the quarters as well as a whole stone circle and spiral labyrinth. Thus, repetition and time can certainly build sacredness in a space. This is an important concept in an American Druid setting and offers us one of the keys to sacred space and time here in the US. 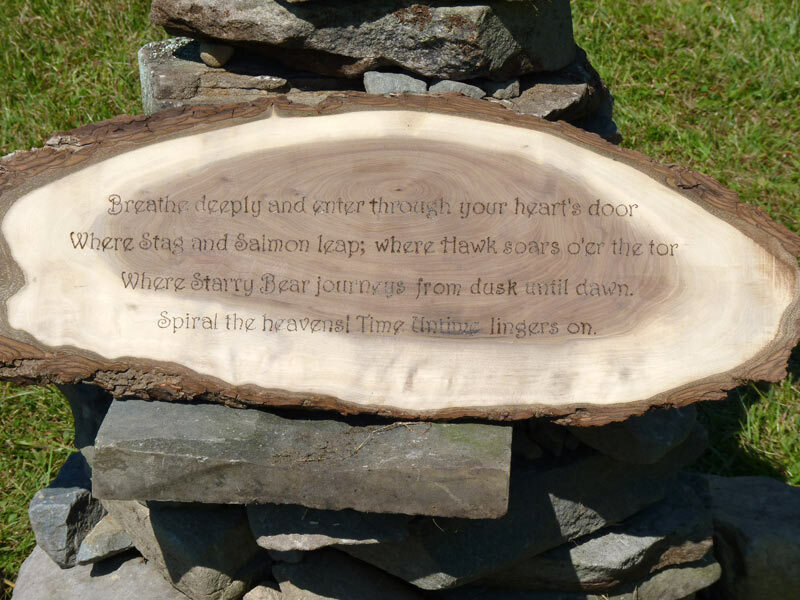 Time, by the way, is one of the pieces often “missing” for American druids. We don’t have that sense of history and presence of old stone circles in the way that our UK counterparts do. Given that, we have different kinds of work and possibilities here on our soil. Meaning. Ultimately, something is sacred because we choose to give it meaning. The nature of that meaning, and the spiritual experiences we may gain through that meaning, is paramount to establishing anything sacred. Part of the reason we have less sacred spaces, times, and places is that the only thing that has real meaning and singificance is money in our culture. Recognizing the meaning and importance of other things is part of establishing the sacred. Symbolism. Symbolism here, also plays a role. We can draw upon existing symbolism (Awen, ogham, the pentacle/pentagram, runes, colors, animals, directions, etc) to bring more meaning to new places/objects/prayers, etc. that we want to bring more sacredness to. Symbolism is connected to meaning–some symbols have long-standing relationships with particular themes (like the pentacle and pentagram, which have been protective symbols for over 5,000 years and are woven into the fabric of our landscape). Symbols, then, help us shape meaning and establish the sacred. Magic and Energy. Sacred space and sacred time is also, ultimately, about magic and about energy. The kind of energy that you can raise in a group setting through ritual (see next section, the kind of inherent energy that collects at the bottom of the waterfall, the telluric energy gushing forth out of a spring. In the hermetic tradition, the simple adage rings true: as above, so below; as within, so without. When we create sacred spaces in the physical world or interact with them, that raises energy on the inner planes. When we raise energy by calling the quarters, chanting, dancing, singing, and more, we bring forth energy, direct it, and shape it in some way. And for many sacred places and sacred landscapes, that energy stays in some way. In the case of the ley lines, as I described last week, the lines themselves faciliate the raising and transmission of energy all across the land. Now that some of the building blocks have been covered, we can turn to ways to bring in the sacred on different scales and in different ways. Sacred moments and time are not permanent sacred places, but ways of powerfully bringing in the sacred to everyday life. Sacred Moments in Everyday Life. Let’s start by thinking about the different ways in which humans experience the sacred in everyday life. Again, thinking about the building blocks above, we can bring in sacred meaning to everyday life in any number of ways—the key is to take a moment in time, give it meaning, and set intentionality. When people say a prayer at a meal, for example, they are taking a sacred moment in everyday life. You can also do this with natural events, as my example will now illustrate. 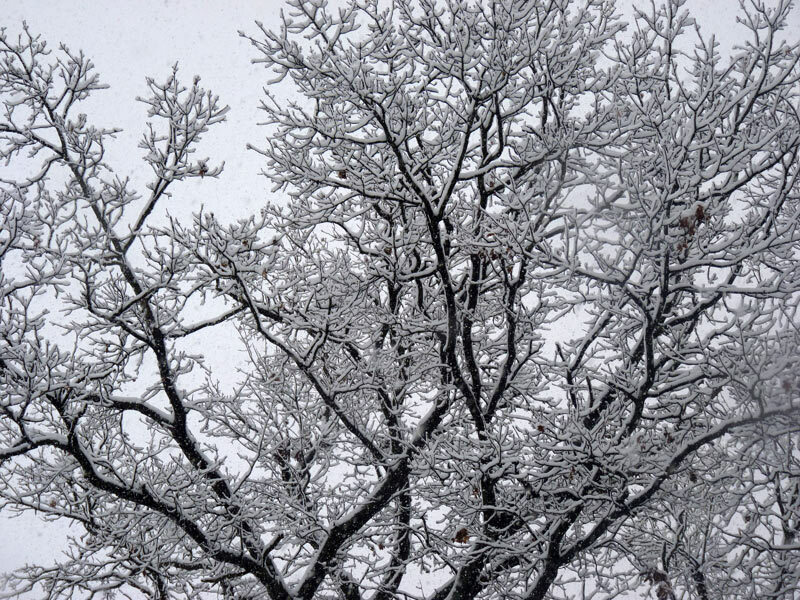 Here’s a simple example: in late November or early December of 2017, the first snowfall happened. I happened to be at work that day, on the 5th floor of our building (the top floor). I went into this lobby area in my department and began watching it in awe and reverence—the snowflakes were big and lazy and beautiful. As I stood, another colleague of mine also came to the window. We acknowledged each other and our mutual love of snow, and then we stood, watching it, for probably about 10 minutes. We recognized, in each other, that the first snowfall was a significant and sacred event, and we took a quiet moment in an otherwise very busy and hectic day to revere it. This is a simple example of observing a natural event, in every day life, and taking a moment to respect and honor that event in life. Sacred Times through Ritual. Another way in which we intentionally create sacred space and sacred time is through ritual. A lot of effort in the druid tradition goes into opening and closing a sacred space—usually about half of our ritual time is devoted to this activity. Why is it so critical? For one, it takes time to do it right and well, to acknowledge the powers and call them forth, to protect the space, to cleanse and bless it. But really, I think a lot of the time spent is in the mind—helping us come out of the mundane and cross the threshold into sacred awareness. We also declare it in some way, by declaring the space open, declaring sacred space/sacred time, and so forth—the declaration of it, the acknowledgement, that all of us are in agreement (in a group) or that you are doing this sacred thing is critical to the task at hand. We use intentionality, symbolism, and time to do this work. Sacred Actions. Another kind of sacredness we can bring to everyday life is the idea of living life in a sacred and intentional manner. This is the kind of ‘everyday’ living that brings sacred awareness to your life. For me, this involves ecological living and permaculture: I use permaculture principles as a guiding light to help me make decisions and recognize that with each moment, I am interacting on sacred land—my actions can help or harm that land. 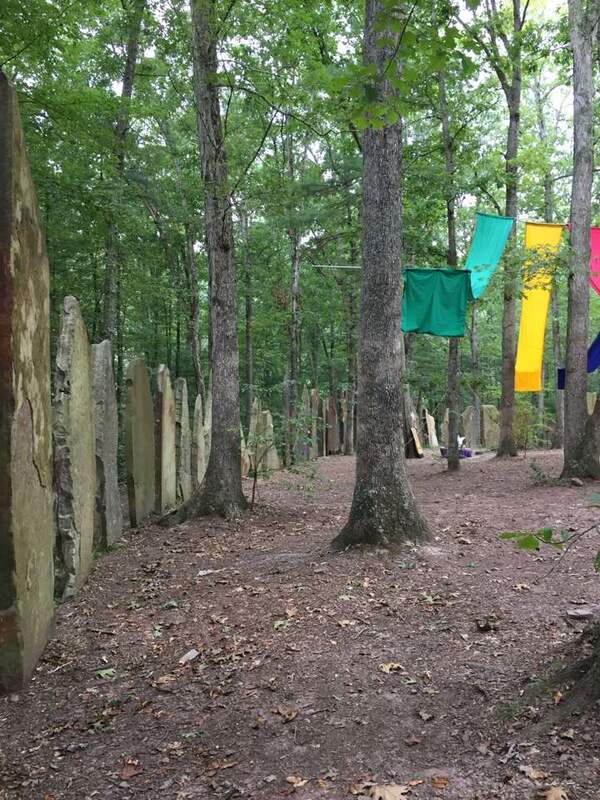 Moving beyond moments, we can think about the kinds of natural and created larger sacred spaces that we might engage with, particularly here in the US, in places were we don’t have bountiful stone circles or ancient sites. Sacred Places: Natural. There are those places that have such inherent beauty and magic that they are already sacred. These are places that we may come upon that simply have an existing “energy” about them that is so powerful and potent that you move forward with reverence and awe. I’ve spoken about one of these places at length, here, on this blog: Laurel Hill State Park’s old growth Hemlock grove. I remember the first time I walked into that grove, it had such a sacred presence about it. It took my breath away. I had never seen anything like it—the ancient hemlocks, powerful and wise—just stood, waiting for me to do something. It is extremely dark, the understory is minimal, and the trees just go up and up. Their trunks are so wide and old. It looks nothing like the other forests of Pennsylvania, who have all been logged multiple times and are in the place of regrowth. Since that moment, I’ve spent a lot of time seeing other people, random people, not just druids I bring there, interact with the space. They enter the grove, their eyes light up, their mouths open, and they grow quiet. It is spectacular, it is sacred, and it is meaningful to the everyday person. Sacred Places: Intentional. Then there are those spaces that we create, that we build, over a period of time. This might be individual or small sacred spaces like I’ve written about before: stone circles, sacred gardens, bee and butterfly sanctuaries, etc. These are wonderful ways of bringing the sacred into our landscapes and everyday lives. Or, this might be spaces that we create together, with our hearts and hands, like the stone circle at Four Quarters Interfaith Sanctuary. Four Quarters has been engaged in an ongoing ritual to create a stone circle for almost a quarter of a century—and it shows. When you walk into the space there, the stones sing to you. They greet you. They each have personality, presence, magic. It is unlike any other place I have been on this land in North America. There can be a social aspect to creating sacred spaces. The idea of people coming together, for a common goal and vision, and lending their energy to meet that goal is a powerful experience. Creating sacred space and sacred time is ultimately about relationship. It is about you being in relationship to something else: a waterfall, a moment in time, a stone circle, your relationship with what it is that you feel is sacred. It is about you taking time out of regular, busy life to engage with the sacred and to co-create the sacred. We co-create the sacred with each other, and we co-create the sacred with the power of the living earth. For me, this is why regular visits and regular rituals/moments are a critical part of thinking about sacred spaces and places. Like an old friend, I am building a relationship with a sacred space or place and that simply takes time.